Our Minor Girls are seeking Championship glory this Saturday, October 20th @3.15pm in Scoil as they face Erin’s Isle in the final. Let’s have a massive crowd out to support the Girls in this huge match for the Club! Our Hurlers hope to go one step better than the Footballers, who had a very disappointing Saturday as they lost out to Round Towers Lusk in a game in which the team will feel they just never showed up for. This tight group of adult players — many of who feature strongly for both codes — will look to bounce back in their Intermediate Hurling Championship semi-final replay vs St Mark’s at 4.30pm on Saturday October 20th in O’Toole Park. All support encouraged for this huge game! Last weekend, the Scoil Uí Chonaill Sirens – Gaelic 4 Mothers & Others Team took to the road and headed out to the LGFA National Blitz jointly hosted by Naomh Mearnóg & St Sylvesters. It’s the only site large enough to host the event which welcomes 2000 women from all over Ireland each October. The event takes in 102 teams and they each play 5 matches each. There is a great family atmosphere, the morning kicking off with registration with fruit & water supplied by Lidl. The warm up is held on the all weather pitches with everyone taking part in the Bokwa dance session. The matches are played on a half size pitch with 10 a side. The Scoil team had a record number on their panel with 20 players kitted out played teams from all over Ireland including Clonbur from Galway and St Senan’s from Kerry. While there are no official scores recorded, suffice to say that the Scoil Sirens Team and banisteoirí Nicole Rock and Sinead de Burca (of Scoil Uí Chonaill Senior Ladies Team) were very happy with their performance. Bake Sale Saturday — Support U13 Camogie Final! The U13 Camogie team have made it to the championship final! A major success for the girls as there has not been an older girls camogie team in Scoil for a number of years. The team is now trying to raise funds for skorts with a cake & book sale and raffle in the Clubhouse this Saturday morning, the 20th of October from 9:30am. Please support the girls by bringing or buying cakes, books or simply a cup of tea! Thank you! Sam Maguire will be making an appearance in Scoil on Saturday, 20th October, from 2pm til 6pm. …You’ll have to get out & support and see! O’Connell Primary School are playing in Croke Park on Monday 22nd October @10am in the Cumann Na Munscoil final, with the majority of the team playing for our Under 11 and Under 12 teams in the Club. It would be great to get support for the team. Please provide a brief synopsis of this group i.e. how long has the group or activity been together or been going on? What is it that you do? The Original "Tough as Teak" crew have been playing together for the last 7 years but we've very fortunate to have gained a number of new players over the last 2 years also. Our team is global in its background; Ireland/Romania/Saudi Arabia/Morocco/Mauritius to name a few😎. However once those kids put on the Scoil Jersey, they are the epitimy of "Oneness". We currently have two teams within the panel and their record on the pitch is as good as any club in the country. Given the demands on all the kids, parents with school & other interests, we currently meet twice a week (training & match day). However as we move towards U12/2019 & gradings/leagues, we are moving training x3 times a week. Many of our kids are involved with their School Teams (Gaa/Hurling) so we remain mindful of burnout risk. 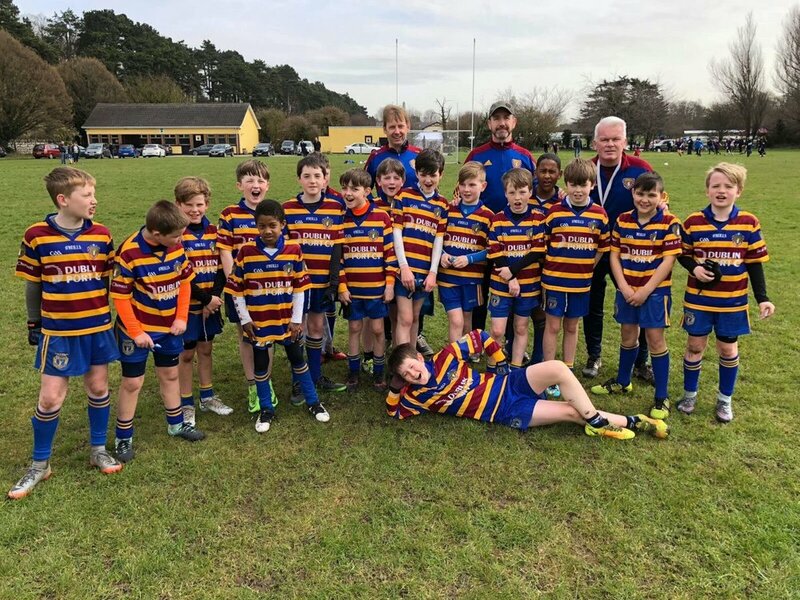 U11 Mentors are 100% focused on ensuring this brilliant but often mental bunch of kids realise their full potential both from a playing & personal perspective. Respect is a key focus whether to each other, opposition, refs, mentors, club etc There have been a few blips over the years (players & mentors alike😂) but in the main all the lads carry themselves with honour & distinction. Last year's Scotland trip which was heavily supported by our crew a case in point. When each of the U11 Mentors (Jp/Liam/Ro) started this journey, we had a vested interested as our own kids were in the panel. However, I can honestly say that we view all the lads, as if they were our own. The biggest selling point to me is the Team Ethos which has been engrained from day one.- No one is bigger than the team. This we hope will provide the platform for many years of success for this great bunch and Scoil / Dublin GAA. Please describe (with anecdotes if possible) any particular characters in the group worthy of a mention. I'll leave the mentors alone (for fear of reprisals😎). Every single one of the lads are unique in their own way but to sum up their ethos/mentality, I was up in the club house/post match one Saturday and one of the lads Fahad, asked me "Why was the Ref so hard on me, was I tackling wrong?" I said absolutely not, you were 100% in the right... when suddenly, Aurelian our wee Mauritian assassin chipped in.... "Fahad, They were soft... This is Gaa not soccer you know"!!! Just class response from our "New Irish" contingent. 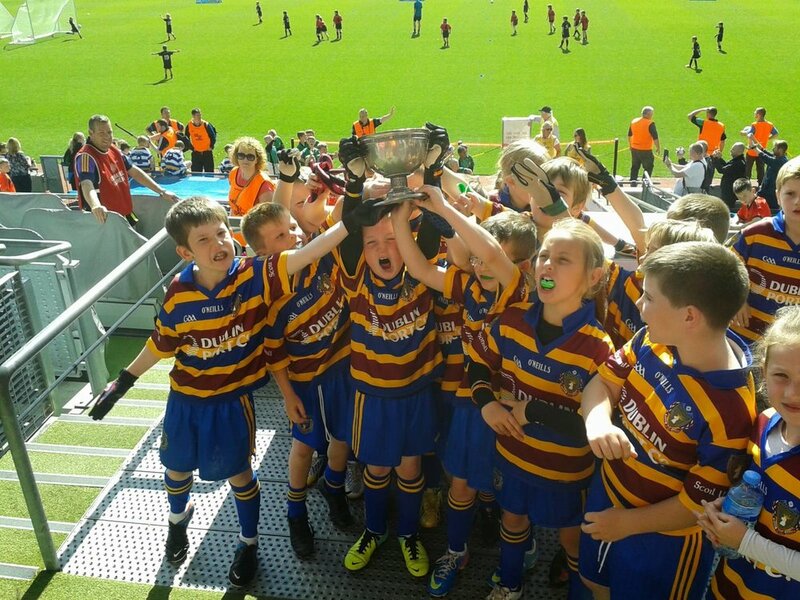 Honestly there have been so many but if I had to single one out, it is a toss up between our U8 Croke Park game where the kids were imperious in victory and/or the Scotland Trip 2017 (both cherished memories for Mentors & kids alike). Lads went on a two year unbeaten run U9/U10 seasons, which is not to be underestimated given the club's we have faced. They have consistently batted above their station! Loyal Lovable rogues that would fight to the bitter end to protect and stand up for each other (which they do). From Day one - U11 Mentors set ourselves a number of goals for this crew. While they are ambitious we refuse to sell these kids short. We remain confident there are future Dublin Footballers & Hurlers in our panel but more importantly future Division 1 Scoil Ui Chonaill League & Championship winners. Congrats to Club Coach (GPO) Thomas Gleeson on leading the Naomh Fionnbarra Intermediate Camogie team as manager to their recent championship win. The Christmas Shoebox Appeal is fast approaching - members interesting in contributing should know the Club will arrange a collection on November 9th. The Adult Footballers lost out to Round Towers Lusk in the Intermediate Championship semi-final on Saturday on a day which nothing went right for them. Our Hurlers face St Mark’s in their Intermediate Championship semi-final replay — throw-in @4.30pm on Saturday October 20th in O’Toole Park. Hard luck to the Ladies team who were beaten by a strong St Pat’s of Wicklow side in their Cup final last night (Tuesday). History was made last Sunday when the Scoil U13 Camogie team travelled to Marley Park for a 10am throw-in in the Div. 6 cup semi-final. Winning by three goals to one the Scoil U13 girls become the first team in the history of the club to make a juvenile camogie final. Camogie has come back to Scoil and the current u13 squad, in existence less than eighteen months, include players from u10 to u13. Over that time the squad has grown from 11/12 players to the current 18/19 players. 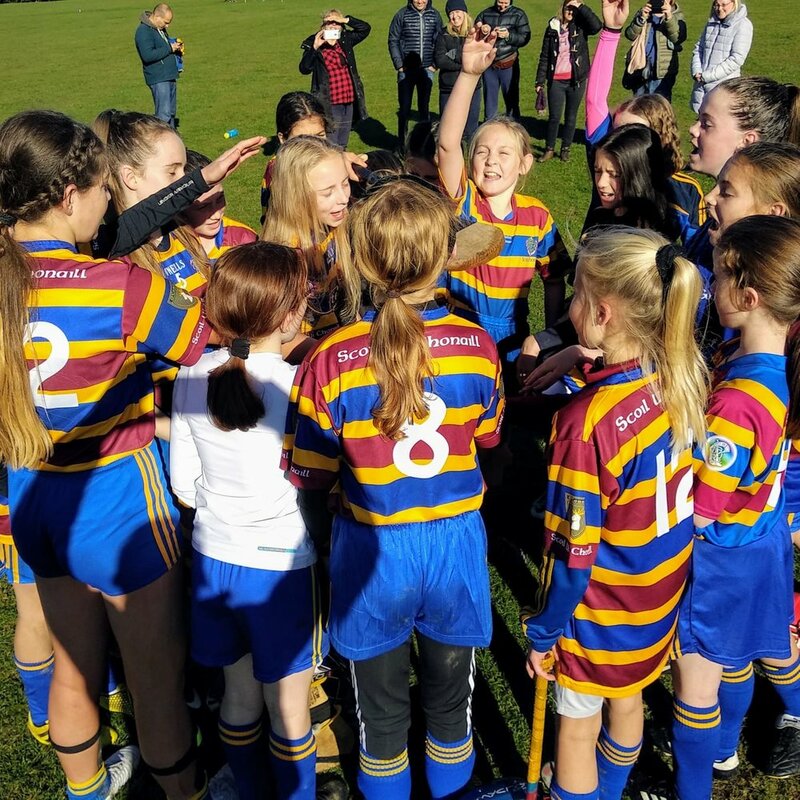 U11, u12 and u13 age groups are equally represented, with each age group providing about a third of the players; two hardy u10 girls completing the squad. It is with hardy u10s we start, for mid-way through the first half the deadlock was broken with a goal from u10 Eabha Mulligan. The ball had been let in high to the square by Realtín (Ray) Candon, who was causing Ballinteer no end of problems with her array of skills, lifting and soloing over distance and putting the ball into the danger area. Some minutes earlier she had narrowly missed to the left of the upright following a twenty metre run with ball glued to stick, defenders scattered in her wake. But what a score by Mulligan. The ball having dropped in and players arriving in numbers to defend and attack, an age of pinball ensued just short of the Ballinteer goal line. Eventually a Ballinteer defender cleared the danger area with a decent strike. Travelling about fifteen metres straight out to Eabha, she met it sweetly with a first time strike of such quality that it would grace Semple. On this gloriously sunny autumn morning, like a pearl rolling over silk, the ball slid briskly across the dew touched Marley Park turf to nestle in the back of the net. Oh happy day; against all expectations and form guides, one up Scoil. Playing against a slight incline in this first half the Scoil girls gave a display of grit and determination belying their tender years. At a significant disadvantage in height, weight and reach, were this a boxing match no bookie would back them. Yet consistently they were first to the ball, relentlessly they battled for ground ball and doggedly they hooked and blocked. By the half’s dénouement Ballinteer had been bruised and confused by a team they had beaten 4-0 in the round stage of the competition. Retiring for refreshments, and Chubby’s counsel, in truth a 1-0 lead was scant reward for the Scoil girls’ display. They would not have it all their own way after the interval. So it proved. With admirable renewed vigour and purpose Ballinteer had at them. So enter the second sister. With the Scoil goal under increasing pressure u12 Sorcha Mulligan gave a player of the match display with stops, blocks, clearances out wide and every single puck out sent long and true. It is more than fair to say that were Ms. Mulligan not policing the sticks an elegiac tale would here have been told! Sorcha and stalwart forward Julie Lonergan will go forward for Dublin Camogie Development Squad trials in the weeks following the impending All Hallows – beir bua! Lest the wrong impression is conveyed here, gentle reader, we did not spend the entire second half camped on our own goal line, far from it. We rallied early, soaking up the pressure and breaking forward repeatedly. Towards the mid-point of the half Scoil won a free in on the 50. Up stepped Ray Candon, who, with pitch perfect accuracy, sent in a high, spinning strike, dropping it just under the crossbar. She swears she meant it! Scoil now two to the good, an eye on the prize and just one quarter to go. With shorter legs and smaller sticks, imperceptibly, the tide was turning against us. Scoil were tiring, Ballinteer were, gradually, getting first to more ball, managing to lift and strike more ball and were getting the chance to solo at us; but still Scoil repelled them. Entering the championship minutes, the dam burst. A strong solo and wicked strike by a quality Ballinteer full-forward proved unstoppable. Mighty Mulligan actually managed to get the stick on it but the sheer power of the shot carried it in. Now we were rattled. Out on our feet and hanging on. Ballinteer sensing this were driving on in search of parity. Novenas and promises of burnt offerings were being proffered to various deities by our side-line cheerleading mammies and daddies. Once again into the breach stepped our sterling girls. Finding energy from I know not where the team was driven on by our exceptional group of backs, u12 Roisín with U11s, Kate, Anna (banana) Catarina, Ella, Aoilinn and Sophie (who played with a suspected broken finger earned in the Scoil Neasáin semi-final win that sees them back to Croke Park). Using the incline to advantage they pulled on and kicked every ball that came near them, driving the ball on and away from danger in a battling display of dig-it-out ground hurling. Half-forwards and forwards Aoife, Niamh, Liadán, Reiltín, Marta, Sadhbh and Julie followed suit, driving the ball on repeatedly. We were defending for our lives, our last throw of the dice; our girls had emptied the tank. Younger and smaller, playing on a big pitch we were out of gas. Should Ballinteer sneak an equaliser we’d nothing left for extra-time. Then, in the sweetest moment, like the cavalry arriving over the hill to rescue the besieged fort, Therese Brown lifted the ball to the stick out on the right, just shy of the fifty. To use that wonderful hurling phrase, she fair left of the shackles; taking off like a Lear jet on a solo run toward the Ballinteer goal. There was to be no stopping her and this girl can sprint. Running straight at goal she finished a nigh on forty metre sprint with the deftest of hand passes to the back of the Ballinteer net. The game was up and Scoil, for the first time in its history, has qualified for a juvenile camogie final. The coaches started this campaign with the sole aim of getting at least one score in every game. What we didn’t expect was to finish third of five in our group, win two of four of our group matches and beat the second place team in the playoff. Now we have first placed Craobh on Sunday week in the final. We’d be long odds for the win, but I wouldn’t bet against us! Our Under 11s (pictured below) played some excellent football last Saturday in a wet Clontarf road! The weather didn’t deter the lads from some super point taking and work rate throughout. It was also a great for the lads to experience our super dressing room facility. Special mention to Fionn, Conal and Tadgh who guested for the opposition St Brendan’s. The lads played an away football game against St Peregrines and it was certainly a soft day so thanks to all the parents for getting the kids out, despite the rain nobody dropped out! Despite the rain the pitch was in great condition and we had two great games. We have managed to field two teams every week since the summer holidays which is great to see. We played peregrines two weeks ago but on Saturday the team I had put in a completely different performance to the last time. Probably the best performance I’ve seen to date. Everyone on the team wanted to be involved and on the ball all the time. The training drills are very evident on the pitch combined with wanting to be first to the ball. I think nearly everyone on the team got on the score sheet with Temi scoring I think 5 goals and 2 points and Richie getting 4 goals and a point and paddy kicking a couple of nice points. Ruairi from his defensive position made a great Jack McCaffery type run to score a great point towards the end of the game. We mixed up the teams a bit for the second half and swapped a few players with Team Colin/Alan. Despite the changes the great teamwork continued in the second half. The SUC team put together one of their best team performances to date against a very strong (and tall!) Peregrines side. The benefits of two nights training were clear and evidence in both technical skills and fitness levels throughout the game. The team was asked to focus on their positions and passing game this week. Our mid field team of Senan, and Joe worked hard to win high balls and run them up (and through) the wings passing carefully to our forwards. and Our new joiner, Michael along with Noah fought hard in the forward line with the final tally of points a poor reflection of the amount of balls won and shots on the goals. An injured Conor Meehan kept us clear of any goal scores in the first half before braving some on-pitch hobbling defensive time in the second half – including an outstanding block to save what would have been a sure goal. Cillian, Jake and Isaac brought up the rear with some disciplined man marking and keeping the shape of the defensive line consistent throughout the game. The team changeover in second half saw Isaac move to mid-field (Conor M to defense and Cillian to goal) with an immediate change of gear. SUC dominated the second half of the game and were easily the higher scorers overall. The coaches were hugely proud with a great team performance and a clear demonstration of individual development and progression across the team. It remained only to wring out the clothes, empty the water from the boots and try dry out before heading home from another great day out for the team!